All MCSA members – Tony and Evie Bowen, Karin van Niekerk, Charles Smith, Cheryl and Greg Divine, Basil Dominy, Peter and Marianne Halbsgut, Fred van Berkel, Werner Frei, Dave Barnes. Trail distance: Around 16 Kilometres. 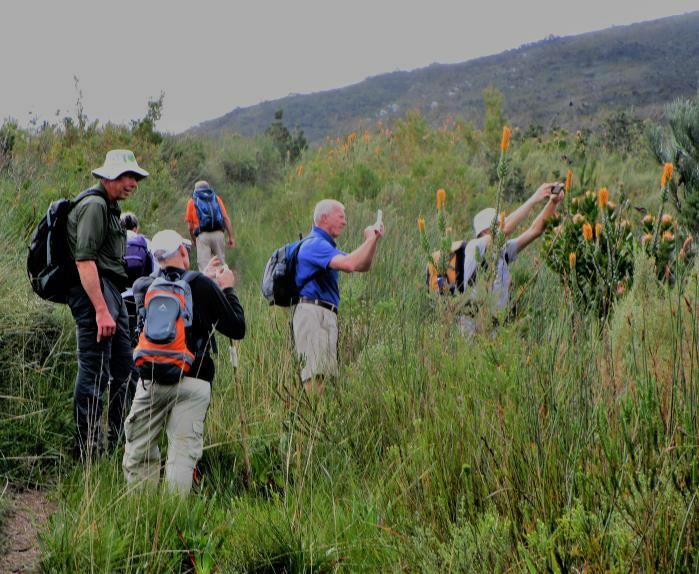 It is mostly uphill all the way to the Tierkop hut- thereafter a section of downhill, along a somewhat exposed mountain path. Once the jeep track is attained -an easy downhill run back to the Saasveld Campus. Access and start of the trail. Access is via the main security gate at NMMU Saasveld campus. Parking is permitted at the Administrative Buildings. From here road access to the start of the trail – a gate just beyond the Student houses. Permits: Self issue permits are available from the Witfontein Cape Nature offices. Trail times: We started our hike at 8.30, while we completed the circuit at 14.15. 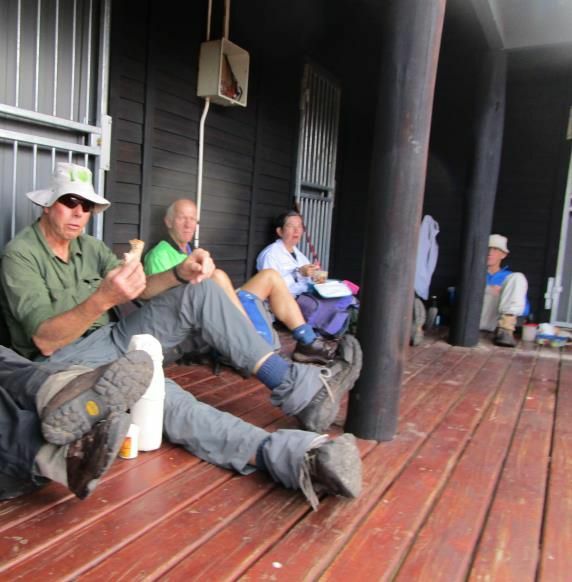 The hike lasted for almost 6 hours which included a tea break at the Dam wall, followed by a lunch stop at the hut. 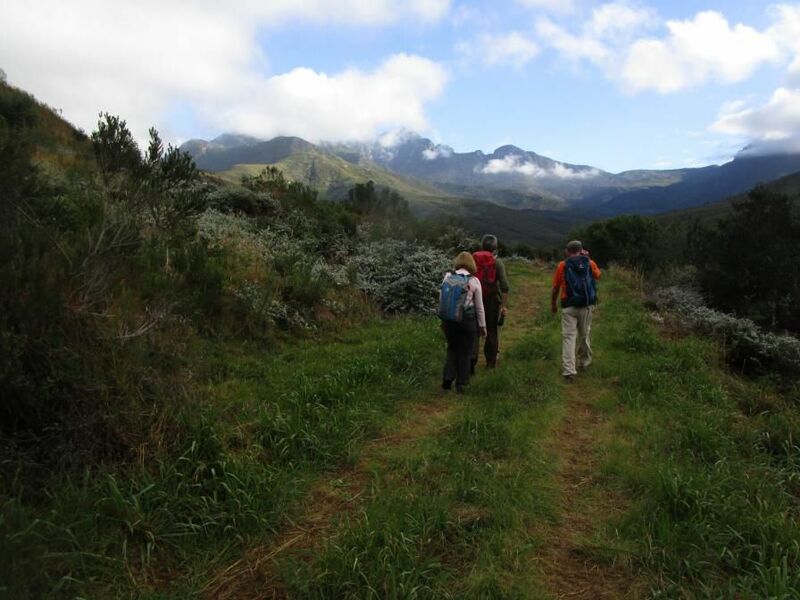 The Hike details: A lovely day out in the stunning Outeniqua mountains. 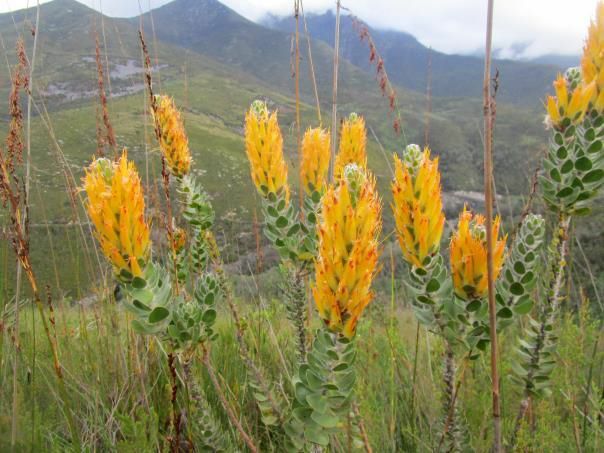 Cradock peak above – wafting in and out of the clouds, the fynbos in good shape – and looking clean and fresh as we were lucky enough to have had shower on the area the day before. George had been experiencing particularly dry hot windy weather during the previous week. Pepsi Pools lost out- no one was quite ready for a swim at 9.30 in the morning – it being July and a somewhat cooler day than the temperatures of the week before. The leaky dam (officially known as the George Dam) – not looking as leaky as it has in the past – where little water spouts normally exit from the higher holes in the dam wall. On inspection we realized why- the dam is very empty- so the level is currently lower than many of the weep holes. 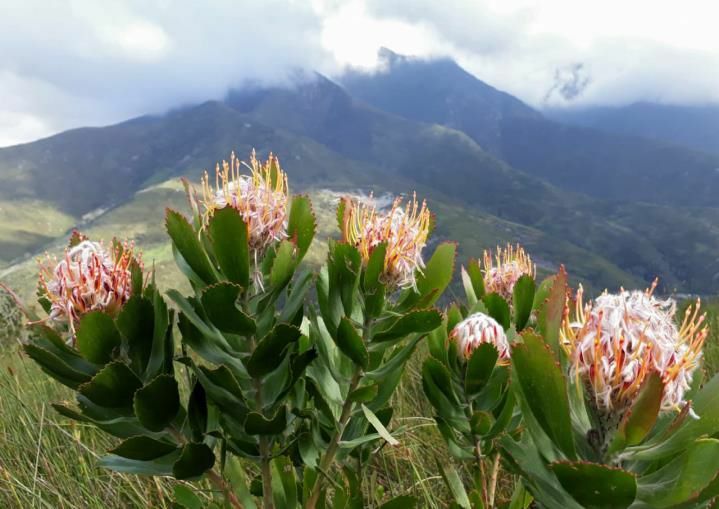 The flowers on the rare plants above the Dam –one of them being a Protea pincushion (Leucospemum glabrum), and the common Pagoda flower (Mimetes pauciflorus). Both at their peak of flowering season. So stunning that our hikers were in fierce competition -juggling with one another for the best position in which to take a photograph. Lunch happened on the Tierkop hut terrace- Lovely views out – however now quite a fortress – notice the bars behind the lunch time guests. The hut had “upgrades” a year or 2 ago, now supposedly neither the baboons or other ‘baddies” can get in / “er weeeell not so far”! Sadly, even overnight hikers are not welcome. After lunch -some discussion as to whether the downhill road was even an option –however the Meet Leader rules – so the much more exciting mountain path was followed. Much chattering on the easy downhill section back to the start of the trail. It seems a good day was had by all. 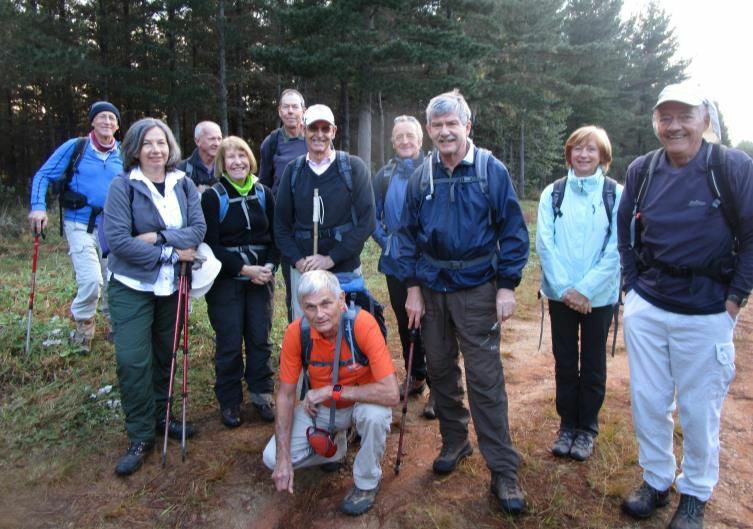 Thank you to all who joined in on this circular hike in the Outeniqua foothills.